One night, on the way home from a dinner out -- where I'd had a glass of wine, a chicken and ravioli entree, and half of a salad -- I was so overcome by hunger that I had to stop for an emergency burrito, which I finished and topped off with another glass of wine and a donut. For dessert. See, I run Ironman triathlons, which consist of a 2.4-mile swim and a 112-mile bike, all capped off by a marathon. Yeah, that's in a row. As you might imagine, training for these races requires roughly the amount of calories consumed by a herd of wild elephants. Plenty of coaches even refer to Ironman as an eating contest with working out mixed in. Since most people won't complete Ironman triathlons in their lives, but eating is universal, here's what I and a few of my fellow triathletes eat to fuel our absurd activity levels. There's no such thing as "three meals per day"
Alyssa Godesky, a professional triathlete who specializes in the Ironman distance, eats two breakfasts every day, then lunch, snacks, dinner, and sometimes a dessert. But she doesn't think it's weird. Actually, no triathlete I talked to thought these meals were weird. They're just part of a normal day for someone training for an Ironman. "If I'm hungry, I eat. If I'm doing a lot of working out, I eat a lot," said Godesky. And she definitely does a lot of working out. Godesky has a system down for making sure she gets enough calories to keep the fires burning. Every morning before her swim workout, she eats a quick breakfast of an English muffin with peanut butter, two homemade "energy balls" of oats and peanut butter, and at least one cup of coffee. After swimming, it's a second breakfast stop for a bagel with egg, cheese, avocado, and more coffee. Then she'll have another snack before her second workout: either leftovers from the previous night's dinner, or a second bagel and cream cheese. Once she finishes her second workout, it's time for a protein shake and a real lunch. Often, that'll be Chipotle. "I've been known to eat Chipotle two times a day, for days in a row, when left to my own devices," she said. But if she's at home, then she'll throw together a grilled cheese, avocado, and chicken sandwich, with some chips, or possibly cook a pizza. If there's a third workout, she'll snack on pretzels or almonds or Cheez-Its beforehand. For dinner, she and her boyfriend will either go out a couple times each week, or she'll make what she calls Pasta Alyssa, "AKA throwing in whatever veggies are in the fridge into a pot of pasta, add some kale and beans, and boom, dinner," she said. Add some peanut butter to ice cream, enjoy a beer with dinner, and you've got a professional Ironman diet. Leslie Miller, also a professional triathlete, has, at various points on rides, eaten the following: Magnum ice cream bars, chili dogs from 7-Eleven, donuts, egg sandwiches, burritos, and cheeseburgers. "Off the bike, I eat really healthy. It's like I turn into the Hulk of food consumption [when riding]," she said. I've was actually with her when we made a very necessary emergency Circle K ice cream stop at mile 90 of a 120-mile ride. It wasn't so much that we needed the ice cream calorically, but we definitely needed it. In July, Godesky raced two Ironmans on back-to-back weekends. In between, she basically spent her free time eating or sleeping. She ate gummies, which she swears taste better in Europe, chicken wings, wine, chocolate, mozzarella plates, steak and potatoes, and Ensure -- lots of Ensure. "I just make sure to eat as much as I can during the days after the first race," she said. "I don't force myself to be picking anything in particular. Just listen to what I'm craving and give my body that." Hey, sometimes the body craves Ensure. There's a saying among endurance athletes: if the fires are hot enough, anything'll burn -- meaning if you're training hard enough, then it doesn't matter what you eat. This isn't entirely true, of course. "It's not ideal," says Beth Shutt, a professional triathlete and dietitian. What you actually throw in the fire is one of the biggest things that separates professional Ironman athletes from mere mortals out simply to finish. Godesky eats a lot, and she definitely doesn't worry about losing or gaining weight. But if you look at her list of foods, it's still pretty healthy. She isn't ordering a whole pizza after every run -- something I've seen less-professional athletes do. "In general, athletes' perceptions are definitely off. They usually think they need far more than they do," Shutt says. And they usually think it all needs to come in the form of carbs: pasta, rice, and pizza. According to Shutt, if you're training about 20 hours per week (standard for most athletes preparing for an Ironman), then you're burning an average of just 2,500-4,500 calories per day, depending on your size, metabolism, gender, and type of training. That's just an average, though. Sure, if you're a big guy, then on your long training day of a six-hour ride and an hour-long run, you might literally need 10,000 calories, because you might have actually burned 6,000-7,000 just in training. But, there's probably also a day where you're burning only 2,500-3,000 calories, including both your baseline and training. If you're a small woman, then those numbers could be lower. In fact, Shutt estimates that during her recent race at Ironman Lake Placid she burned only about 3,500 calories during the actual race. Which sounds crazy, but exercise tends to burn far fewer calories than people realize. Of course, Shutt is a professional, so she primarily eats gels or liquid calories while racing. For most people, all bets are off during a race and after. An athlete at Ironman Canada once explained to me that he liked to put fried chicken and a joint in his "special needs" bag to pick up halfway through the marathon. I never did find out if he actually finished the race after enjoying that concoction. Shutt concedes that for a lot of people -- like maybe Stoner O'Chicken up in Canada -- it's a mental thing. After training so much, endurance athletes often feel like they've earned the right to eat a burrito, a bag of Oreos, and as many fries as they can find. And sometimes we just need a mental pick-me-up in the middle of a long or hard workout (or race). The key is that over time athletes learn and do what feels right to them and what keeps the fire hot. 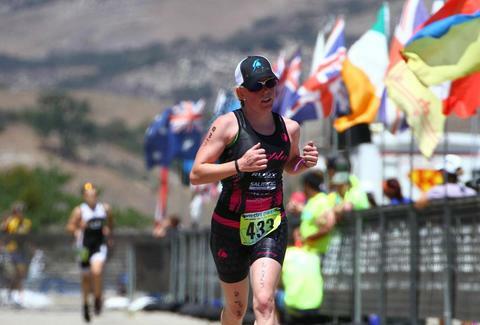 Kelly O'Mara writes about triathlon, marathon-training tips, and Olympic athletes. She also is racing her third Ironman in October. Follow her @kellydomara.